Imagine there’s a cupcake fair in your community. You have your heart set on Red Velvet and there are two counters selling the same. Counter A has a animated bunch of customers digging into the cake and has a banner saying “last 20 pieces left” while Counter B adorns a deathly, almost funereal look. Which one would you go for? If you are thinking Counter A, you are not alone. A study was conducted in 1975 where researchers wanted to know how people would value cookies in two identical glass jars. One jar had 10 cookies while the other contained just two. Though the cookies and jars were identical, participants valued the ones in the near-empty jar more highly. And that’s the scarcity principle at play. It essentially means that people tend to place higher value on an object that is scarce and a lower value on one that is available in abundance. No wonder, marketing guru Robert Cialdini cites ‘Scarcity’ as one of the six golden persuasion principles in his book “Influence”. When combined with Urgency, which is essentially the other side of the same coin, the two make for a potent weapon for increasing eCommerce sales. Here are some examples of how different eCommerce websites creatively use this persuasion principle to increase conversions. Displaying your stock meter on the eCommerce product page is always a good conversion practice. Not only does it ensure there are no last-minute heartbreaks for the customer, it also speeds up the buying process. A user might be convinced to make a purchase, but he/she might not be always willing to buy right away. They might want to compare the prices on other websites, look for discount coupons or simply forget about the product — thanks to the myriad distractions of the web. 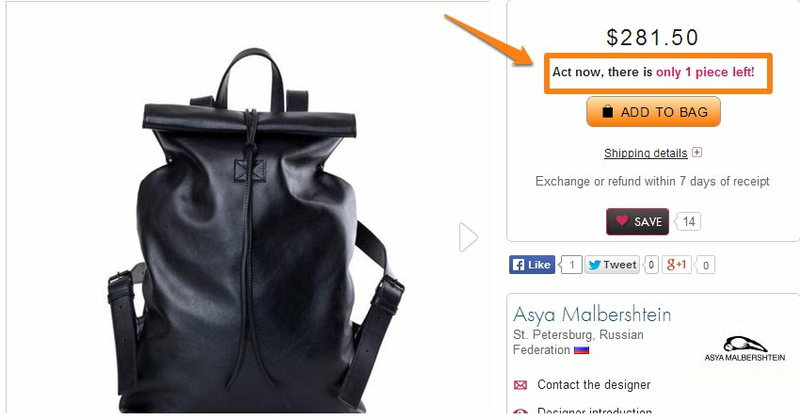 Look how ModMomFurniture flashes a message that ‘only 3 items left’ of a particular product. Here, Boticca almost urges visitors to complete the purchase right away. The use of an active verb like ‘Act’ is used to drive immediate action. Here is a list of more words that drive urgency and sales. You head to a shop to buy a denim and figure out that the last piece in your size has just gone out of stock. Old story? Well, if it could happen in the real stores all the time, why couldn’t it happen online? Intimating the buyers when a particular size goes out of stock is killing two birds with one arrow. Not only is it a huge favor for the prospects, the information also works as a positive reinforcement of the product. 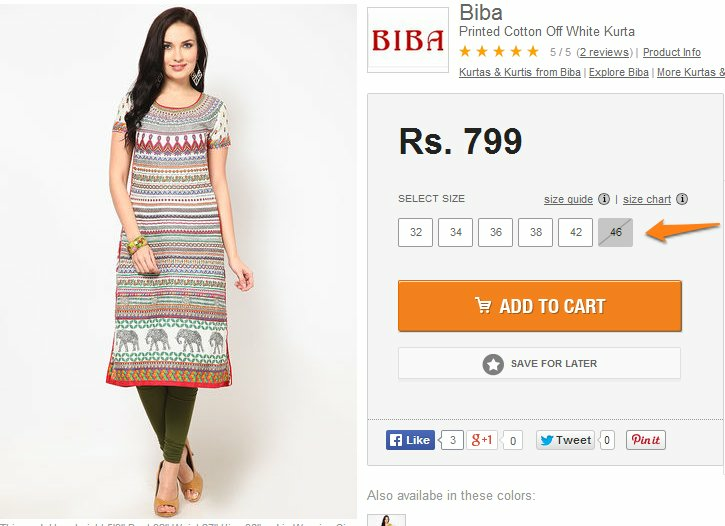 See how Jabong represents the unavailable size in grey. Zappos goes a step further and even shows how many items are left for a particular size and color combination. If you are already offering next-day delivery, then ‘time-bound purchase’ won’t cost you any additional resource. You just need to inform the users how many hours/minutes do they have to complete the purchase so that their order qualifies for next day delivery. When you ask the visitors to make the purchase in a specific amount of time, you not only make them more proactive towards the purchase, it also eliminates any kind of confusion at their end as to when they will receive the order. Zappos has a permanent banner on its homepage saying that you need to order before 1pm to qualify for next-day shipping. Amazon shows the exact number of hours/minutes within which the purchase needs to be completed to qualify for next-day shipping. Two women fighting over the same item of clothing in a fashion store is not just a devilish mind’s fictitious construct. While popular Hollywood movies might have taken these fights too far, the fact remains that people are much more inclined to buy something when other people desire them too. So while they are considering whether or not to buy those shiny leather shoes and they suddenly realize that another person is mulling the same purchase, it replicates the physical store scenario where two people grab the same item at the same time. 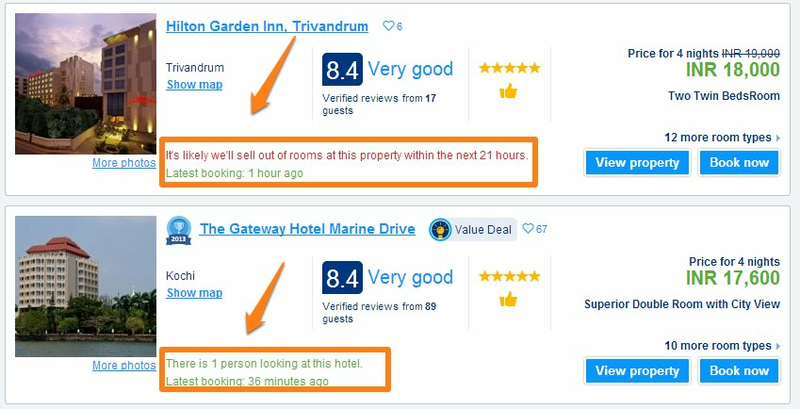 When you look at a property in Booking.com, it shows you exactly how many people are checking out the same property at that exact moment. Hotels.com even gives you information about how many people are viewing properties in a particular city. A modal box pops opens and shows you your virtual competition/companions. The fear of missing out (FOMO) is a legitimate one. It is the anticipated regret of not being able to seize an opportunity. A limited-time discount works exactly at that level. It makes the offer look so tempting and fleeting that one is compelled to seize the opportunity. OverStock dramatically uses a running countdown to accurately show how long the sale will last. MakeMyTrip.com shows an alert when the last few discounted airline tickets are left in stock. See how they use color psychology here to instill urgency. The use of the color ‘Red’ is not a mere coincidence. The color is associated with energy, increased heart rate and is often used in clearance sales. The average online cart abandonment rate is 67%. While a majority of these carts are not redeemable, re-marketing efforts can salvage some of these lost sales. Offering limited-time discounts on abandoned cart items is a great way to use the urgency principle to re-market products. However, the risk here is of overdoing it. You do this too often and you will see your ‘e-mail open rate’ nosedive. See how Miracas offers a 5% discount for just the next two days. Seeing some items disappearing from the cart might just be the reality check users need to wake up and salvage the rest of the cart items. See how Snapdeal shows a ‘Sold Out’ message next to one of the books in the following example. Well, this works the same way as limited-time discounts. The desire to avail free delivery could possibly offset the visitors’ tendency to procrastinate the purchase. A two-day or a weekend sale has its own charm but a special discount hour can be used to galvanize excitement around that specific hour. Zivame sent out this mailer to subscribers to build up craze for its hour-long sale. E-mails letting subscribers know about last day of sale is another great way to get their attention. 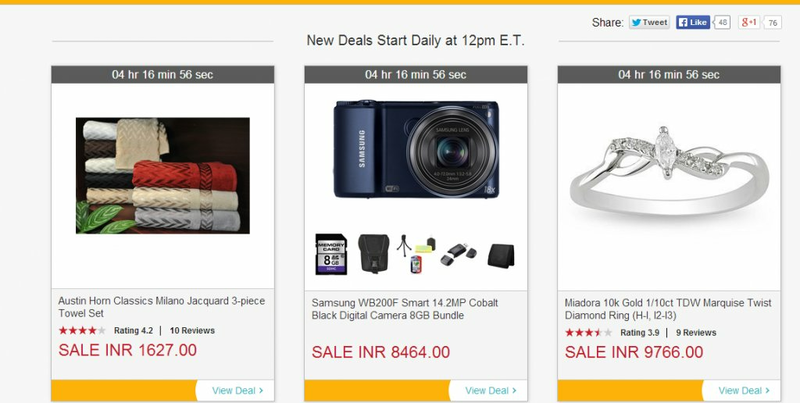 See how Myntra makes use of Orange color to drive action here. According to color psychology, just like Red, Orange also has an aggressive feel and creates a sense of urgency to do something. Before you set out to use any of these tactic mentioned above, there are three golden rules you should keep in mind. ‘Scarcity’ or ‘Urgency’ work best as motivators to quicken the buying process but the customer will have to be already convinced to make the purchase decision. While they are great procrastination killers, don’t expect them to generate demand. If you go back to the initial example, it’s only once you have decided to buy a cupcake that you will value the cupcakes in Counter A more. You will have to truly convince the user before you flash the scarcity card. Urgency is a subtle art. Yes, I know that sounded slightly oxymoronic but don’t go about faking urgency or your customers will get a whiff of it. Be honest. Don’t try to get rid of the stock that won’t move by flashing messages like ‘hurry, only last two pieces left’. First they will catch your bluff, then you will become a laughing stock and then they will leave you. Here’s a real life example of how that happened. Even if you are using the scarcity principle in all earnestness, don’t go about overdoing it. You don’t need to employ all the practices with multiple countdowns breathing down customer’s neck. You will come across as pushy and shady and untrustworthy and manipulative. Moderation is the key, though testing will give you better insights as to what will work for you. Great Article. I Recommended your Post as a Blogger. Thanks for Sharing with us. Great post, if eCommerce marketers follow the advice given they will surely increase sales. Yet consumers are getting wise and waiting for abandoned emails with discounts. Mohita, do you think it’s beneficial to always offer a promotion? It’s fascinating how such subtle approaches can accelerate the rate of sale and increase overall sales revenue. Stock and size scarcity is brilliant in the way that is serves as useful information for the buyer and it creates urgency. Thanks for sharing the great examples. Great Article. you All Tips will he me to increase my eCommerce Sales. Thank you very much for Sharing. Very good article. I try email notification to my shop. And I want try some timer for limited offer, but must search some modul to prestashop. In my opinion special discount hours are best, since users will hurry to use the limited time offer. Nice article. 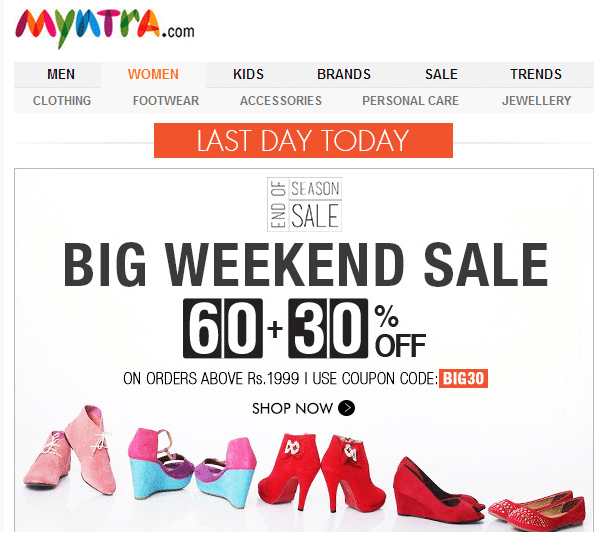 Myntra I think is one of the best in using most of these strategies. No doubt, they are one of the most popular shopping stores online! And in addition, they have such large variety and great offers and coupons, that people find it exciting to shop with them. Others that came to my mind is Ebay and Amazon, which makes great use of such strategies. They have struck a perfect balance in between their products and marketing strategies. 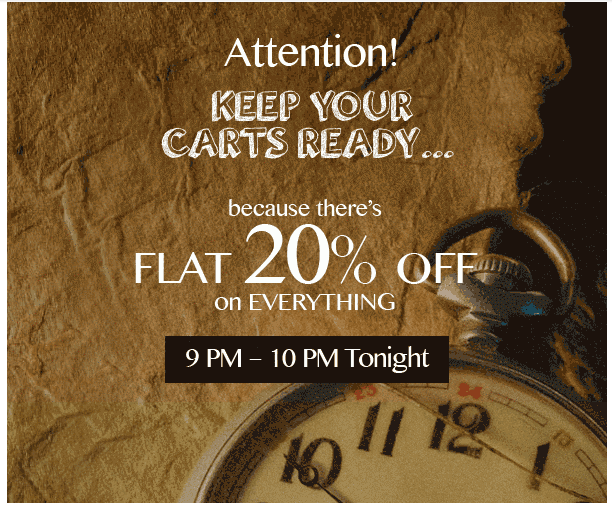 You have nicely pointed out the urgency tactics ecommerce sites are using to increase the sales , apart from this one more tactics they are using is Flash Sales. Specially for launching the new mobile models and it works wonder for them. MI has launched its Note 3 and Note 4 models through flash sales which sold like hot cakes. Not sure how effective it is for launching other categories. Those are very useful and effective tips for sales, I think will be very effective.